I recently adopted my little Tinkerbell from a nice lady in Ancaster who was moving away. She is scared of everything and everyone except my boyfriend and I. Help?? I adopted max from Peggy adams 3years ago,and,he is afraid of everything. When we take him out if he hears any loud noise he will run the other way. He is 7years old,and,I think he was abused by his other owners. My dog nip was scared of everything when i got him at 8 weeks old it took time but he got better at the time i bought two puppies and the other pup was confident and it made my shy pup more confident, but when they were 5 months the confident pup severely attacked his father which we have so we had to give the puppy to my mum, after this the shy pup lost its confidence and was scared of everything, my advice is to not give it to much attention when it acts like this otherwise it will believe you are agreeing with it, be confident and she will see this as how to be, it might take time, when going out if she's ok with people stroking or talking to her then let it happen, if she backs away and you don't tell the person to stop or if you don't walk away then she will trust you less. I remember when my pup was 6 months and i took her out and someone tried to stroke him and my pup backed away, and my partners answer was let the person keep trying, well the pup started growling and i said he don't like you so you should stop, but this person kept trying then my pup tried to do a pretend bite and then he did bite i then took the pup of my partner and walked away. If your dog growls at someone and they don't listen the next option is bite, but it don't have to get that bad. Just let people talk to your dog first and watch her reactions. My pup will let people stroke him now. Just like our rescue boy Jack, also on this site. He was scared of everything. Try going near what she is scared of showing that you are not afraid and if she shows even a little confidence, give her a treat. It may take months. It took a year to get our Jack's confidence, and I still keep reasuring him. It works but have lots of patience. Well, you said that you just got her, so I think it might take some time for TinkerBell to adjust. 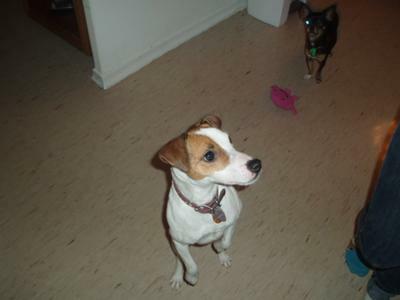 She is a very sweet and cute smooth coat JRT. After you have had her for awhile, this should get better. I don't know what the situation was with her previous owner, but something was going on there. Do you know how old she is? She looks young to me. Not over 5 years old. Okay, so here is what I would suggest. Take TinkerBell for walks around your neighborhood, parks and let her meet other dogs, cats, kids and adults. If she's OK with them, let them pet her. After awhile TinkerBell will begin trusting them. She isn't right now. If she is uncomfortable with them, then pick her up and let them pet her. It takes months, but she will become more socialized and be a happier JRT. The best to you all and a very HAPPY NEW YEAR 2011! !